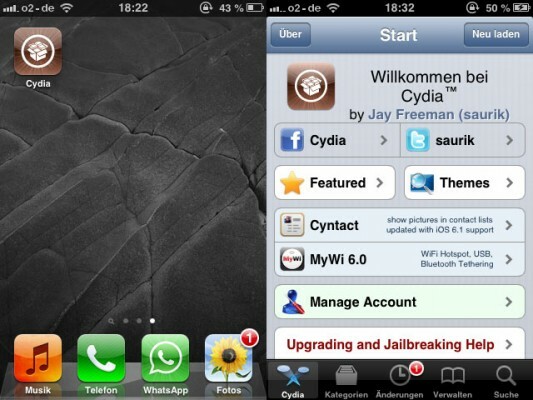 You can Jailbreak all Devices that are able to run iOS 6 and above(iPod 4G+5G, iPhone 3GS+4+4S+5 and iPad 2+3+4+mini)! Step 2: Extract the download onto your desktop and open the evasi0n folder. Right click on the evasi0n.exe file and select Run as administrator(in Windows). If a User Access Control window pops up, choose yes. Step 4: Plug in your iDevice to your PC. Note that evasi0n will jailbreak any device running iOS 6 and above, except of course the Apple TV. Step 5: Evasi0n should now show that it has detected your device. Once your device has been detected, the Jailbreak button will be activated and clickable. 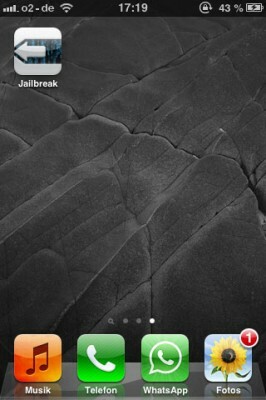 Step 6: To begin the jailbreak process, click the Jailbreak button. Step 7: Evasi0n will now proceed through several steps. Among other steps, it will prepare jailbreak data, reboot the device, upload Cydia, inject jailbreak data, and upload the Cydia packages list. 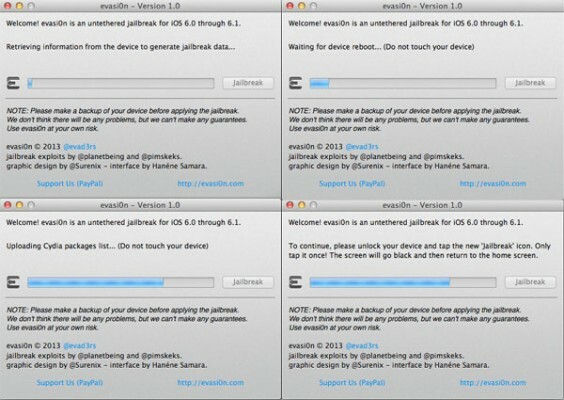 This is probably the more time consuming part of the jailbreak process. Just sit back, and wait for evasi0n to take care of it all. Step 8: Evasi0n will now ask you to unlock your device. On the Lock screen, Slide to Unlock your device, and you will see a new app icon on the second page of the Home screen named “Jailbreak”. Tap this Jailbreak app icon once (make sure to only tap it once), and the screen should go black and then return to the Home screen immediately. Again, make sure you only tap the Jailbreak icon once. Step 9: We’re in the home stretch. Evasi0n will continue displaying messages such as injecting jb data, and Root Filesystem successfully remounted. Your iphone, iPod touch or iPad will reboot, perhaps more than once. The first reboot will take longer than usual, so once again, be patient during this one-time setup. Again, be patient and don’t touch anything. 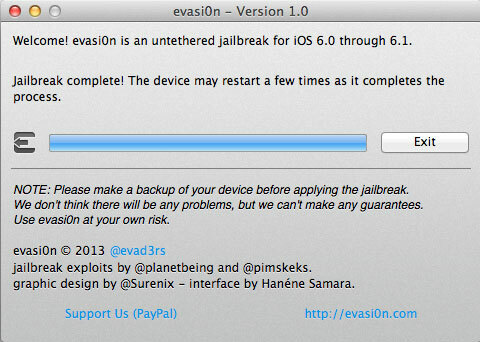 Step 10: Once the jailbreak process has completed, evasi0n will tell you that you are “Done.” You should now see a large evasi0n logo showing on your iOS device screen. It should appear once or twice briefly, and then stay on for a bit longer. Finally, you’ll be taken to your Lock screen. From there, you can Slide to Unlock your iOS device and you should see the Cydia icon on your Home screen’s second page. Notes: Remember to reenable your passcode if you removed the passcode as suggested in Step 3. Stay away from iOS 6.1.3 once it is released. Just enjoy the jailbreak, back up your SHSH Blobs in case a downgrade solution becomes available, and remain confident in the abilities of the genius hackers who are responsible for this and future exploits. HI I am sorry to say aziz404 that no Jailbreak is released and probably a jailbreak for 6.1.4 will Never be released. This is because the only thing 6.1.4 is know for is an" Updated audio profile for the speakerphone " and judging by the size of the update ( 11 MB ) it also says that this update doesn't offer anything grand. Also know that from the WWDC Conference we know that iOS7 is coming out next fall , jail-breakers are probably working on a jailbreak for the next major release. I'm sorry to say but you will have to stay with iOS 6.1.4 and it is highly unlikely you can revert to previous iOS Versions (iOS 6.1.3/2). So for now stick with iOS 6.1.4 , and wait for the next iOS7! Also, just wanted to state that 6.1.5 for iPod 4g's is also tethered jailbreakable with Redsn0w.